I’ve been making handbags for almost 15 years. It’s a weird obsession that started in 1995 after I spent a semester studying in London. A few years ago, I had small business producing really cute, hot-pink PVC laptop bags in China. As I learned about the state of our planet and the impact of the fashion industry, I felt increasingly guilty about the path I was on. My new line, reMade USA, was borne out of my frustration over the dearth of durable materials that didn’t harm the environment. My solution: Used leather, a material found in spades at thrift stores in the form of jackets, many of which are probably en route to a landfill. 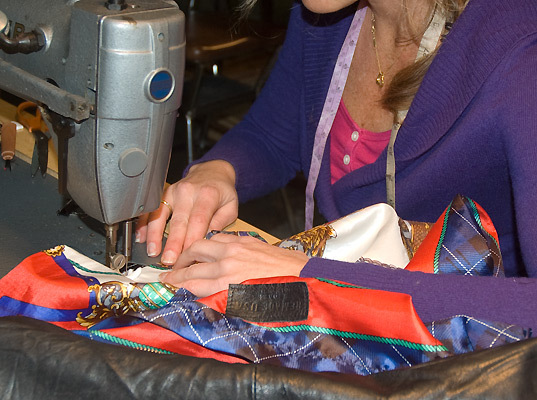 Because no two jackets are alike, the process of deconstruction and creating a bag is unique. I have a couple favorite thrift stores that I like to shop for my jackets. Large, black ’80s jackets tend to be my best find; they yield a lot of leather and are usually in really good condition. Plus, the details are usually pretty cool. Once I have my jacket, I usually make some quick sketches of possible bag shapes, taking the garment’s details into consideration. 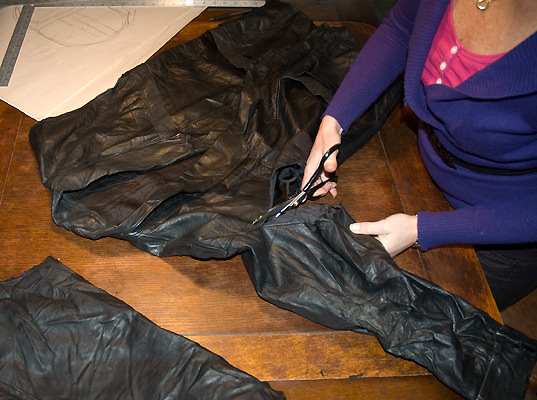 I start by disassembling the jacket at the seams, discarding the lining, and often, its big, rotted shoulder pads. Next, I clean the pieces I am going to use with leather oil, and if it has a musty smell, I hang it in the sun for a couple days. I do some calculations and cut my pieces, usually without a pattern. 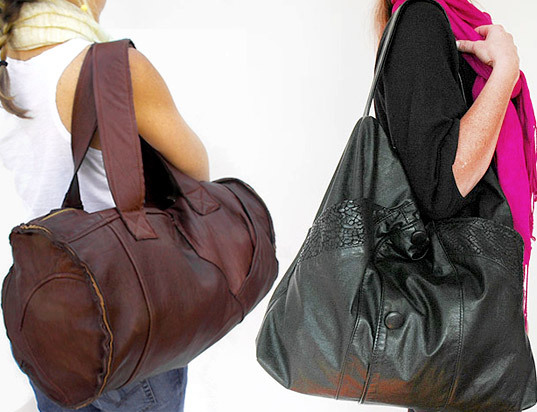 I’m really into big bags, so this bag will be a large as the jacket allows. (The straight-edge and rotary cutter are my favorite tools.) I’m going to use the very cool, big ’80s pockets as a major element in the design, stitching them together to create the front panel. 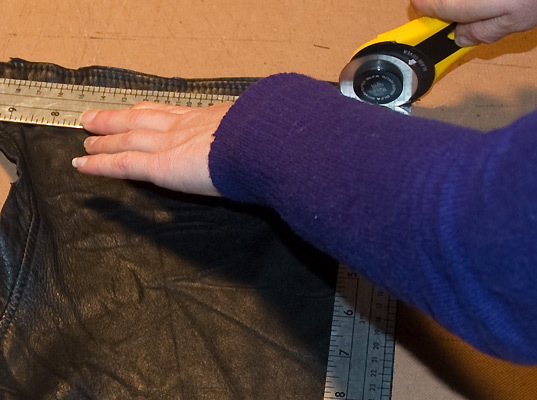 I skipped a bunch of steps, but here I am sewing the zipper in to what will be the top panel. I got this really cool machine for making my labels. 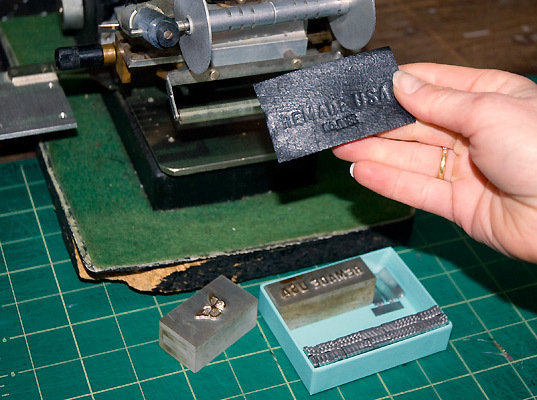 It’s called a heat stamper and it allows me to press the logo and serial number into each label as I go. I also have a butterfly stamp that each bag gets on the outside, representing rebirth. 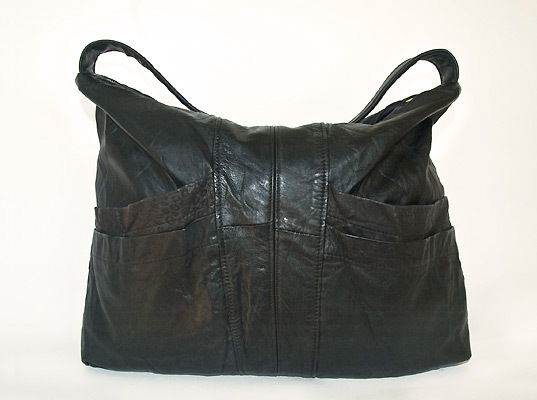 This bag gets a funky ’80s scarf as a lining with the leather label stitched into it. My hang tags are also hand-made. 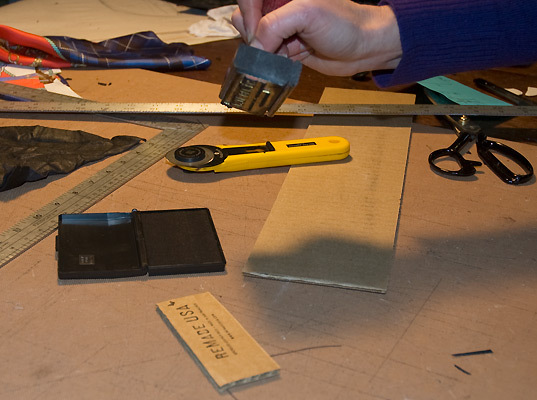 I use cardboard from old boxes and cut leather strips from scraps for the ties. I have a rubber stamp for the logo. Each bag gets a hang tag. 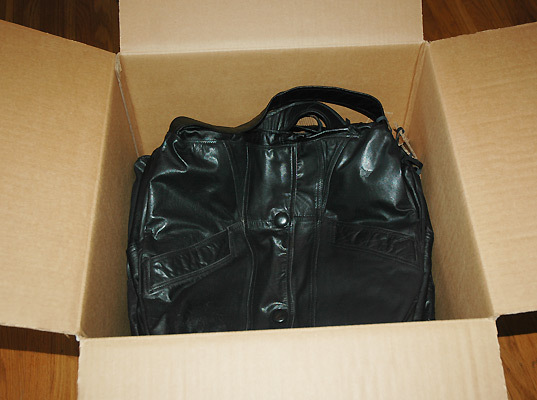 Finished bags boxed and ready to ship to Barneys! I've been making handbags for almost 15 years. It's a weird obsession that started in 1995 after I spent a semester studying in London. A few years ago, I had small business producing really cute, hot-pink PVC laptop bags in China. As I learned about the state of our planet and the impact of the fashion industry, I felt increasingly guilty about the path I was on. My new line, reMade USA, was borne out of my frustration over the dearth of durable materials that didn't harm the environment. My solution: Used leather, a material found in spades at thrift stores in the form of jackets, many of which are probably en route to a landfill. 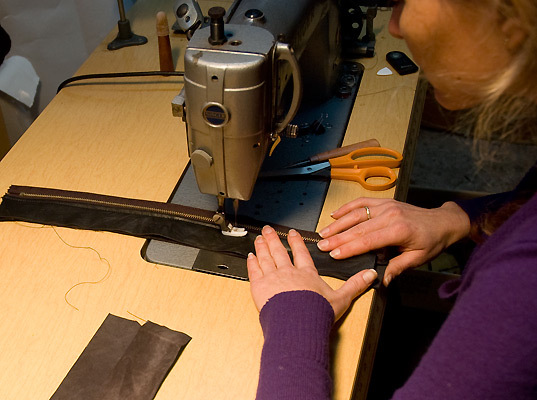 Because no two jackets are alike, the process of deconstruction and creating a bag is unique.